While you might not think much of DeKalb brings to mind tropical islands, there is at least one strong tie between the cornfields and the Caribbean: The NIU Steelband. The band has a strong and devoted following and much of its current popularity is owed to Professor of Music and Chair of Steelpan Studies Liam Teague. Teague is a world-renowned musician, often hailed as the “Paganini of the Steelpan.” A native of Trinidad and Tobago, he came to NIU as an undergraduate to join the university’s unique Steelpan Studies program and to play in the NIU Steelband, the longest-running steelband at any college or university in the United States. Under the tutelage of program founder Al O’Connor and Cliff Alexis, Teague excelled as a performer and student. 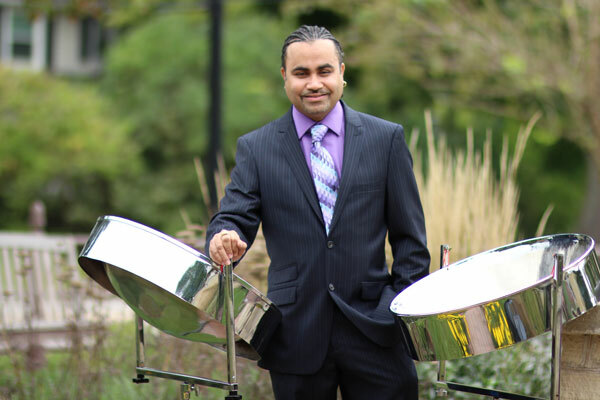 With their encouragement, he worked to become a professor in the School of Music and eventually direct the steelpan program, which to this day is the only program in the nation that offers undergraduate and graduate degrees in steelpan performance. Teague has performed all over the world, and had the honor in 2015 of performing with the National Symphony Orchestra at the Kennedy Center for the Performing Arts in Washington, D.C. He has played with the St. Louis Symphony, Taiwan National Symphony and Czech National Symphony. In his native Trinidad he received the Hummingbird Silver Medal, one of the nation’s highest national honors, in recognition of his service to culture. In April 2018, Teague was honored as an NIU Presidential Research, Scholarship and Artistry Professor. Recipients of the award are selected on the basis of significant and sustained scholarly or creative work, including the achievement of national or international reputation in their individual fields. Janet Hathaway, the Acting Associate Dean in the College of Visual and Performing Arts and former Director of the School of Music, credits Teague with not only being an excellent instructor and musician, but also with achieving the rare goal of increasing awareness of his instrument. “His profile as a performer and composer and his ability to attract excellent guest artists and collaborators ensures that his students, and the NIU community, are exposed to musicianship at a very high level,” she added. Teague directs the 30-plus member NIU Steelband with Yuko Asada. The band performs regularly in concert here at NIU as well as at conventions, arts series and at public schools, colleges and universities.